Web Dictate Online Dictation Software is a dictation system that lets you record, edit and manage dictation over the internet. You, and other users, log into a server running Web Dictate to record dictation with any ordinary web browser. You can save or edit your dictations online. When you have finished recording just click send and the recording will be sent to your typist immediately by email.You can also use to to dictate from home. Broadband Internet Connection 64kbps or above. ...... For example if you are at a conference overseas you can use the hotel's internet access to dictate. You can also use to to dictate from home. *Lets you record, edit, play and manage dictation over a network or the internet using a Web Browser. *If you install it on a computer connected to the internet you can dictate over the internet. *Almost unlimited number of users (10,000) can be setup on the one machine. *Each user can have many files save on the server (limited only by hard drive space). *Web Browser editing includes record, play, insert, overwrite and append. *Files are sent directly to the typist via email. *Very user-friendly web based interface which is intuitive and easy to use. 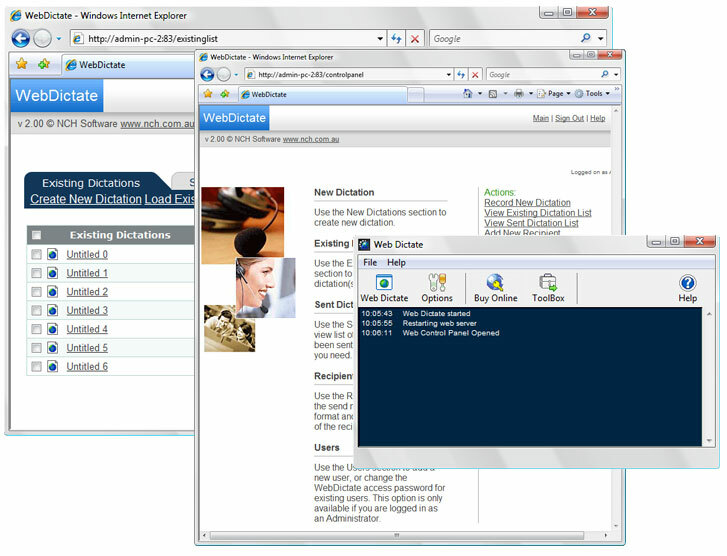 Qweas is providing links to Web Dictate Online Dictation Software 2.03 as a courtesy, and makes no representations regarding Web Dictate Online Dictation Software or any other applications or any information related thereto. Any questions, complaints or claims regarding this application Web Dictate Online Dictation Software 2.03 must be directed to the appropriate software vendor. You may click the publisher link of Web Dictate Online Dictation Software on the top of this page to get more details about the vendor.